This Blend takes a bit more time than some of the others, but I have to tell you—it’s my favorite child. It works in almost anything thanks to its creamy, deliciously sweet flavor profile. Don’t drive yourself crazy dicing the veggies—a rough chop if fine. Just try to make them roughly the same size so they cook evenly. Some markets do sell frozen sweet potatoes that have already been diced. If you can find these timesavers, use them. Pick up some frozen carrots, too. Then you can skip the steaming and simply flash-thaw them by pouring cold water over both veggies and go directly to the blending step. 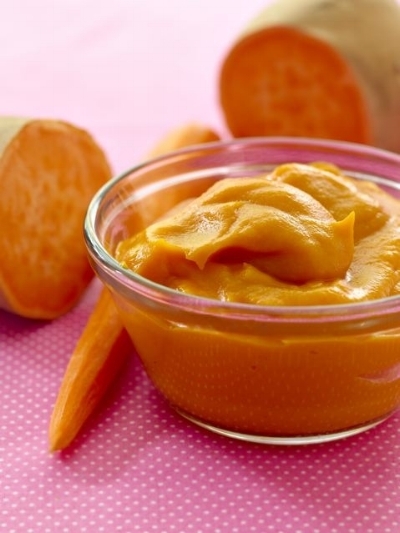 You’ll need about 4 cups of chopped sweet potatoes and 3 cups of chopped carrots total. Place a steamer basket into a large pot, pour in a few inches of water (make sure the water is below the bottom of the basket) and set it over high heat. Add the sweet potatoes and carrots and steam, covered, for 15 to 20 minutes, until fork tender. Blend veggies into a with 2 to 3 tablespoons of water and until smooth, adding more water as necessary.